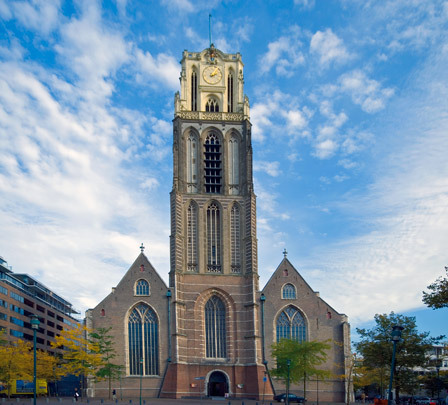 The St Laurenskerk (or Grote Kerk) is the only built reminder of Rotterdam in the Middle Ages. The city's principal church, it was erected between 1449 and 1525, though its tower was increased in height several times until as late as 1645. A cruciform basilica in plan, it has a central aisle of six bays and two broad side aisles with small shallow chapels. A less-tall, narrower pentagonal ambulatory surrounds the choir. Facades are of brick, interspersed with bands of stone; piers and sundry decorations are of sandstone. The nave and the side aisles have a roof of wooden barrel vaults. Badly damaged in the Second World War, the church was restored between 1952 and 1970. The bronze doors, whose theme is War and Peace, were designed by Giacomo Manzù and installed in 1968. In 1991 the church was enlarged by Wim Quist with five black stone-clad cubes connected to each other by glass passages so as not to obscure the height of the church windows behind.